Prem Shah and his wife Reejan Mallashah from Edmonson Park first discovered New Breeze by the Dahua Group more than one year ago. “The idea of living in a new community that was centrally located to several facilities, major infrastructure and expansive green areas was a prospect that appealed greatly to us,’’ Mr Shah said. “So much so that we also enticed many family members and friends to purchase over 30 homes in the community to join us. “We loved the idea of creating our very own friend and family community and they very much liked the idea too. “The lots purchased were small and affordable which is what we were after. Friends and families make a community: Prem Shah with his family and one of the friends he has introduced to New Breeze. 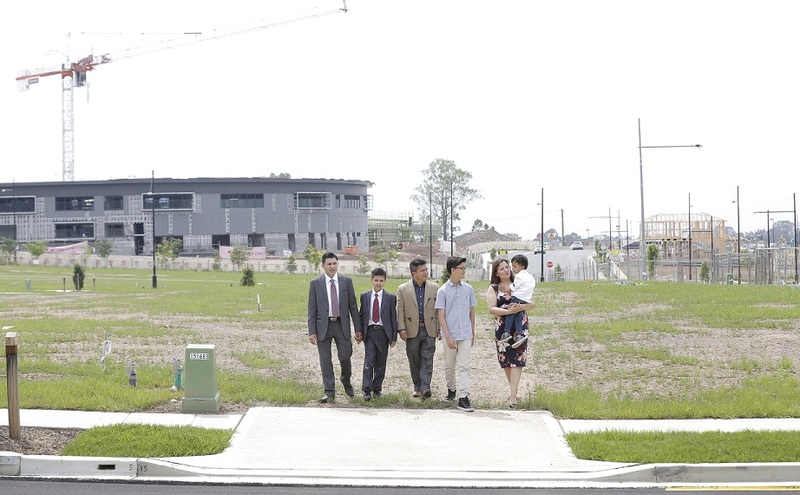 Nestled in the heart of the expanding South West Growth Corridor, New Breeze in Bardia is driving a trend of friend and family neighbourhoods forming within the larger community and Mr Shah is just one example of that. New Breeze is fast approaching the land sales finish line with well over 840 land lots and house and land packages now sold, valued at over $360 million. “New Breeze is shaping up to be a highly sought-after neighbourhood,’’ says Mr Shah. “The Edmonson Park Train station is across the road, Edmonson Park Town Centre is well under way and is adjacent to the development and Bardia Public School, undergoing a $35 million facelift is next door. The master-planned community is a South West success story, according to Stephen Bambury, sales manager at New Breeze. “Its proximity to existing and future infrastructure has been a catalyst for its land sales results as well as the community’s position in the middle of the South West Growth Corridor,’’ he says. Dahua recently received development approval from Campbelltown City Council for its $7.7 million Maxwell Creek Oval project in New Breeze. 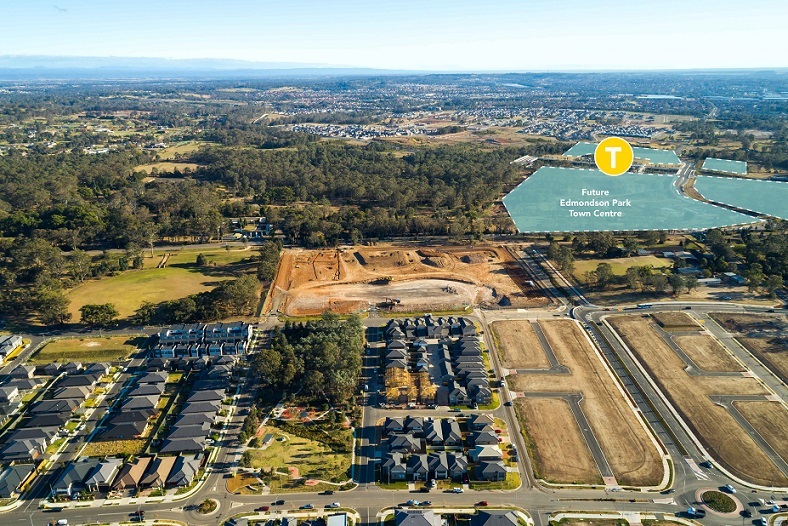 Located in Parkside (Stage 3), Maxwell Creek Oval spans approximately 12,000 sqm and has elevated views from the surrounding area into the precinct. Features include a large playing oval for cricket and two full-sized fields for rugby league and soccer pursuits, nature-based play area, flying fox, swings and slides, picnic area, shaded barbecue precinct, swing, climbing equipment and amenities building servicing the sports facilities. Development approval was also granted earlier this year for Ingleburn Park and the Northern Corridor, valued at approximately $3.3 million and connected to Maxwell Creek Oval. Ingleburn Park, comprising over 4,125 sqm, will be an active recreational space featuring a climbing wall, fireman poles, climbing net, slides, play equipment, shelter and seat walling. Land lot sizes in New Breeze start at 200 sqm with prices from $340,000. All of the lots are easy build and are positioned within walking distance to Parkside’s recreational facilities. The community will comprise approximately 1,300 new homes with a range of housing types. New Breeze is eight kilometres from Liverpool’s CBD and about 45 minutes from Sydney’s CBD. It is at the gateway to the expanding Sydney South West Growth Centre and provides easy access to the second airport at Badgerys Creek, scheduled to open in 2026. Liverpool Westfield, Casula Mall and Crossroad Homemaker Centre are all within a 10 to 15-minute drive. Twelve public and private schools including Macquarie Fields High School and William Carey Christian School are also within a 15-minute drive. The sales office is located at 77 Bardia Avenue, Bardia. For further information and to register your interest in New Breeze visit www.newbreeze.com.au or call 1300 832 482.